Some days ago it was held in London the first edition of Generate Conference, an event dedicated mainly to web design. It was really an exciting and inspirational day. You can have a look at the twitter stream to have an idea of what happened. Below you can find a transcript of the notes I took during the day, for the most interesting/inspiring talks I attended, and some considerations on the day after. But before all, let me pay compliments – and thanks – to Jo Brakes, Oliver Lindberg, Ruta Marcinkus and all the other organizers (surely missing someone from the list): you made a great job, really impressive! Reduction creates essence. Silence and pauses give structure. Details clears up. Repetition makes things memorable. Quite obvious, isn’t it? Nevertheless we “improve” things by adding features and contents, not by refining and perfectioning the existing ones. Design is a process. Problem solving is a process. Business is a process. Oh, how much I loved this concept. We are accustomed to see the business like an abstract entity, while at the end is a process to do something (money, products, better lifes, awareness, services, whatever you want). If you see it from this point of view, then it becomes the natural prosecution of our daily work. Design and business are not antithetical, but they can ally, leading to an uniform process. More and more we get hired by companies to design the internal information processes, more than to paint a pretty picture on the outside. Your information architecture is your brand architecture. This also made me think how much nowadays we are involved in the business process of companies. I’m thinking to Alberto Brandolini’s job, or Luca Mascaro EVO’s approach to design. That willy-nilly we are in some way also responsible for the success or fail of a business. That we have to accept the “risk” (see the others talk below) of being “accountable” of our design. This great opening keynote was perfectly in line with the closing one, about the work done by Mark Boulton Design with the Cern website redesign. Technology will be just seamless by 2020, web will be everything and nothing at the same time, like electricity is now. Don’t be fooled by the title: this talk – probably the most inpiring of the day, for me – was not about web standards, browser compatibility or how to support different devices. It was an insight on what is going to happen in the next decade with web, applications, objects, systems, and expecially their (inter)connection: not only data/information exchange, but also action/intent exchange. Rethink how we relate to technologies. Tear down the silos (between them). Apple will not support NFC, it’s a shame. Stephanie made a wide presentation on how web intents/activities can change the way people interact with the web and the applications, on how “internet of things” will rely on predicting and measuring sensors that will make our “experience” with technologies more natural (but at the same time will make our personal data available to third parties, with all the ethical, political, economical and social consequences we already know). 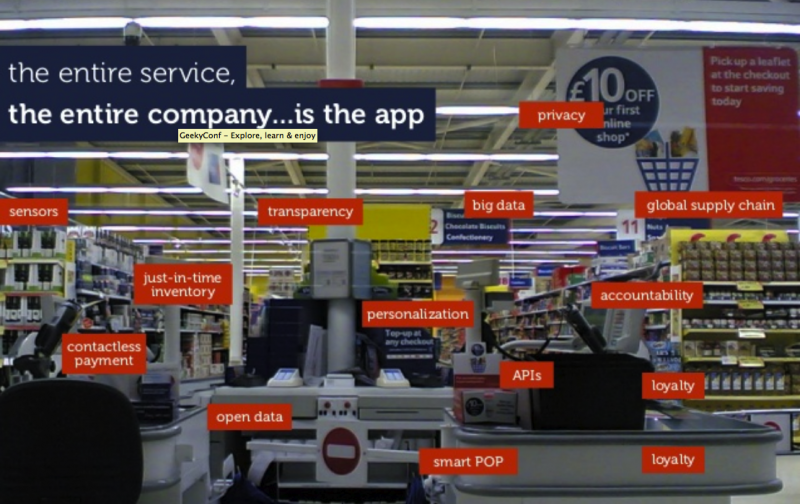 TESCO -> The company is an app. Well, this was an enlightment. Tesco CEO declared “in the future, app development is going to be just as important as property development”, and if you think about it, makes sense: every company now is a technology company. Smart POP/POS, contactless payments, loyalty cards, just-in-time inventory, global supply chain, accountability, privacy, personalization, sensors, big data, all of these competencies and technologies are now in the perimeter of a company like Tesco. At the end of the talk I had the opportunity to discuss with her about the implications of the enormous amount of data these applications will be able to collect (and probably deliver to someone) expecially with the rise of the so called “quantified-self” and the increasing number of applications in the medical/healtcare field the portable device will have. At the end we came to the conclusion that, as always in human history, there will not be a way to completely prevent an “evil” usage of the data. So it will be our responsability to make the “good” prevail. Obsession. Momentum. Obsession of momentum. Momentum of obsession. A very intimate (intimistic?) presentation this one, built around this Albert Einstein quote: “Life is like riding a bicycle. In order to keep your balance, you must keep moving”. John showcased all the works he have done when he had an agency in New York, and how all the communication with the people he tried to create at the end was nothing but “crap” (his words). Working for big brands – Audi, Levi’s, Nike, Nokia, Microsoft, British Airways, IBM, just to mention some of them – was making him obsessed. Up to when the credit crunch made him crash too. He was done, he wanted to quit, he needed to find himself. Fear. Fear of a failure, of not giving to the customer what he asked/wanted. Fear kills brands. At the end, fear is what gives taste to life, what makes an ascent (to a mountain, but also to your personal goals) worth to be done: the risk. Think about the bicicle, once again. It’s ok to crash: you learn, you back on. Back to my primitive passion: the bike. Simplistic. Being crisp and clear. He started from the only thing made him passionate about something. He started to work for bike builders, following their communicaton and designing also the bikes themselves. He could experiment, push the boundaries, take risks. Like using drones to film a commercial video. His design has become very clean, sharp, strong. He finally found himself. A good presentation, on how the “play” attitude is important in a company. In how “having fun” with our jobs makes us work better. At Twilio for example they can use 20% of their time to experiment, play, discover and this in the long term is a winning choice. I was very eager to see this talk, because lately there are lot of discussions about how to approach the CSS architecture of a project (OOCSS, SMACSS, BEM are the recurring words), but I am absolutely not convinced of it, so I wanted to hear the point of view of someone working on global-scale projects like Guardian or Twitter. Naming things is the most important skill in computer science. You need to manage the complexity, the complexity of CSS selectors in particular. I totally and definitively agree with this: you can “smell” a good programmer by the way he names his functions, variables, classes, IDs, etc. It can seem something crazy, but that marks the difference between someone who lived on his own skin how complex and messy can be naming things in the wrong way, and someone who haven’t and so doesn’t know (yet) how harmful can be a wrong naming. That said, the examples taken to demonstrate that OOCSS is a good solution to the problems of naming and complexity didn’t convince me, it seemed to me to solve one problem but raise a bigger one (“classitis”, a.k.a. very–long_and_unreadeable–class_names and a mixture between content and presentation). Code quality = correctness, reliability, maintainability, performance, etc. Nothing is perfect, nothing lasts, nothing is forever = Change. Your work should be oriented to the change. Optimize for change, plan for change, expect the change. Good code is the one that can easily change without breaking things. Layer of CSS: document, base, module, layout. The idea is to divide the CSS “logic” in four different levels, each one indipendent from the others. If a CSS declaration (read: selector) involves two or more level, this is a “code smell” that we are not working in a modular/object-oriented way. I agree with the necessity to subdivide our CSS in logical “layers”, but in this case then is better to follow the SMACSS approach (Base, Layout, Module, State and Theme): more adherent to the day-by-day usage I can see in my work. That said, I still don’t get the whole “separate HTML structure (nesting of tags) from the CSS structure (nesting of selector)” picture. Since there is no perceivable impact on performance, and since today we all use CSS pre-processors, where mixins, extensions and nested declarations makes extremely easy keeping HTML and CSS structure in sync, the only “problem” that remains is the naming of classes and IDs (yes, I said IDs). But in this case the solution is worse than the problem it tries to solve, introducing structural/presentational naming and overbloated class attributes in the HTML code. Sooner or later I’m going to prepare a specific blog post about it, if not a talk. I followed this speech away from my seat, so I don’t have written notes of this talk, which I remember full of slides with magnificent examples of web design. 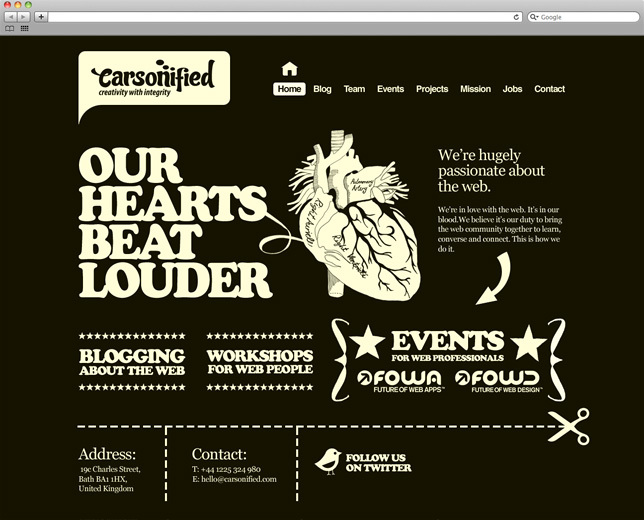 One thing that I clearly remeber is my gasp when I saw the slide below: this is an old version of the Carsonified website, and I remember how much i liked it and was impressed when came out. Mike also spoke about the strong relationship between story, storytelling and design and one thing he said really hit my mind: create design from the story you want to tell. In other words, first of all you have to create the story and start from that (which means also the content) and then the design will “automatically” follow. Some numbers: the work was a year-long project. The discovery phase took almost three monts (market analysis, user research, etc.). After that, three different design team in three different parts of the world, having access to this analysis, worked on the concept and visual design of the website for about four weeks, coming out with their own independent proposal, that was sent to the client. And that was rejected. Fi was menace to lose the job if not able to deliver a new proposal by monday (it was friday). So during one single weekend Anton, Irene and their team conceived and delivered a completely new – and winning – solution, finally accepted by the customer. After the presentation I had the opportunity to speak with them, and they told me that the team for the whole project was composed by only 3 visual designer, 3 ux designer, 1 project manager and 15 developers: an impressive, high-quality, huge amount of work done by such a few people: still can’t believe it! The title of this talk was very intriguing, because I was expecting a talk about why sometimes a designer needs a certain dose of arrogance and confidence (that is, taking decision and choices without “listening to what users want”, without making polls, without measuring anything, etc.). Instead it was more about bad design, when lazyness (sloppy execution) and deception (even if non malevolent) prevail on well-done design. Everyone is designer (also a developer, a project-manager, a sysadmin) because he contributes to the final design of the product. So he is also responsible for it. Passionate about what you do. + We need confidence to take risk. I liked very much these concepts, in which I strongly believe: if there is not a strong committment on how the design plays a central role in a project, the final result can be unsatisfactory. But at the same time, as a designer, we should always put as much passion and love as we can in our works, even when they are not as much “perfect” as we would desire/hope. And accept the risk to take decisions (and responsability) for what we do and deliver. And he added: “If you aren’t passionate about what you are doing, go and do something else”. In his presentation, Jonty used the word “detailed design” in place of “visuals”, as more related to the “prototype design” concept. And I personally liked a lot this verbal shift, I think I will adopt it. Because it is all about the big “D” of Design. Well, Mark is always a certainty, when on stage. He delivered a perfect closing keynote. He built his presentation around the story of how they worked on the re-design of the CERN website, explaning . Being close to the problem, makes you understand it better. Because you need time for the story to play out. And here we go back to the concept that is the story that drives the design. Don’t hide from content. What is your content made of? Yes, it’s hard to ask, it’s hard to produce. But if you are a designer that is what you work with! You need to care, it’s your brick & mortar. Making things is messy. That’s the way it is: good design involves people, and people is messy. This was the core of the speec (also the title of the talk). And I totally agree: we constantly forget that people are complex and complicated systems (yes, both); they are non-linear, nor necessarily logical, and above all they are weird and messy. Like Muhammad Ali in his epic 1974 match against George Foreman, if you are in a difficult situation, be silent, undergo and wait: at the end you will come out as winner. The product must be out, in front of real people. Think to the project in a native space (typically, a browser) rather than in a Photoshop space. You have to think to the stuff the web is made of. Well, if you have read above, you’ll agree there’s only one conclusion I can draw: it’s been an amazing, unforgettable, first-time conference. just cant’t wait to see the next year edition (because I’m sure there will be one, right?). Other links, comments, slides, etc. As someone tweeted: great speakers, beautiful venue, delicious food, lovely people. Well done!